Urbiztondo, PANGASINAN – Sorrow and consolation can’t be separated as they are two sides of the same coin. 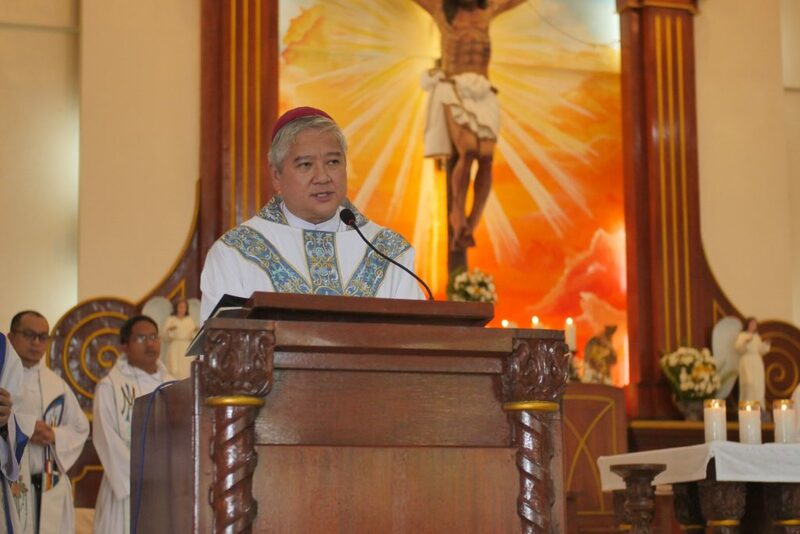 This was the content of the homily delivered by Archbishop Socrates Villegas during the mass he officiated at the Augustinian Recollect parish of Our Lady of the Visitation in Pasibi East in Urbiztondo, Pangasinan last Sept. 4, 2018. The archbishop was the main presider of the mass celebrating the Solemnity of the Our Lady of Consolation, patroness of the Order. Also present and concelebrating were the members of the Provincial Curia led by the Prior Provincial Fr. Dionisio Selma, OAR. Meditating on the gospel passage where Jesus, hanging on the cross, entrusted Mary to his disciple John, Archbp. Villegas said that he firmly believed that before John brought Mary to his home, Mary allowed him to enter her heart. What this meant, the archbishop said, is that “Mary’s consolation comes to us with sorrow and through sorrow.” He added that Mary is able to console others because she shared in the sorrows of her Son. A hundred and twenty (120) years after they left their mission areas in Pangasinan, the Augustinian Recollects are finally back, thanks to the invitation of Archbp. Villegas, to administer the parish in Pasibi East. The Augustinian Recollect missionaries were one of the very first missionaries in Pangasinan, arriving in the area as early as 1609 and erecting mission territories which survived until today. After the mass, the archbishop also blessed the newly readjusted parish rectory which now has a private chapel dedicated to the Our Lady of Consolation and could now accommodate three religious.